It's difficult to approach certain movies without the smallest morsel of cynicism, especially when they are undertakings with as convoluted a past as "Exorcist: The Beginning." Practically any movie news site would be happy to report that this theatrical release is actually the second complete version of a prequel to William Friedkin's immortal 1973 scare-fest, assembled from scratch by director Renny Harlin after the studio's first cut (directed by art-house filmmaker Paul Schrader) apparently wasn't even scary enough to be re-edited from scrap footage, let alone deserve a release. What Morgan Creek might not have consciously realized at the time, however, is that their decision to completely redo an existing and unreleased film was something for the cinematic history books, a resolution so excessive and tricky that it represents a case of decision-making that is simply unprecedented in its extremity. Furthermore, to simply erase one man's entire effort and replace it with another's also meant that a second film based on one premise would be a big gamble financially; unless it set box office charts on fire, the studio would actually be coping with the loss of money from not one but two films. That's good decision-making for you, I guess. The reality of this situation probably didn't start settling in until after Harlin's version of the movie was complete, but Morgan Creek's damage control machine was obviously fueled long before that. Consider the very limited media promotion surrounding its actual release - a trailer here, a trailer there, nothing substantial - or the little advanced buzz from anyone involved in its making. To boot, the studio even pulled that ever-so-notorious ploy of releasing the picture without advanced screenings for members of the press (an approach usually saved for films that have little hope of surviving inevitably-bad word-of-mouth, especially on an opening weekend). If I myself had not followed the incessant drama of this undertaking, in fact, it's quite probable that I might have not even known the film was coming out in the first place. And heck, after you've endured the travesties of "The Village" and "Alien vs. Predator" in the recent weeks, perhaps the idea of seeing another thriller shrouded in an element of secrecy isn't exactly that appealing, either. Those warning signs, as it turns out, exist for little reason other than to flaunt the studio's obvious uncertainty with the project, and despite what you may hear from the generally negative critical consensus, "Exorcist: The Beginning" is actually an interesting little piece of entertainment: stylized, ambitious, and filled with scenes in which the element of creepiness seems genuine rather than synthetic. We could, of course, spend time talking about the fact the screenplay by Alexi Hawley is almost non-existent (take away the fact that the film's main character is supposed to face a demonic possession, and you have no reason for it even existing), but why bother? Here is a movie franchise whose fame has come, gone, and eventually been sacrificed to the nightmarish results of two less-than-stellar sequels. Therefore, the fact that another movie in this series can be amusing at all without insulting basic intelligence is a miracle in itself. For those familiar with the premise (who isn't? ), Stellan Skarsgård plays Father Merrin, the old priest of the original "Exorcist" feature, who would eventually give his own life trying to drive an evil force out of the body of an innocent young girl. Here, we meet Merrin in a considerably earlier time: shortly after the end of World War II, where the conflicted priest apparently witnessed (and unwillingly participated in) tragic events in Nazi Germany. Since those dark days, however, his faith has wavered on the brink of non-existence (indeed, how can you be 100 percent devoted to God when you witnessed the massacres of the Third Reich? ), and whenever someone introduces him as "Father Merrin," he is quick to negate that title. "I am not a priest anymore," he insists firmly. As the movie opens, Merrin, now a self-promoted archaeologist is told of an ancient Christian church being uncovered in the Turkana region of Kenya, which he is promptly asked to study because of its seemingly unusual age and origin (Christianity, after all, didn't arrive in the region until centuries after this supposed church had been structured). The former priest is, at first, reluctant to associate himself with the venture, but the idea of being at the center of such an investigation is a temptation simply too hard to resist, particularly when the Vatican itself indirectly encourages the research and sends a colleague to assist in the discovery. His accepted task is made all the more fascinating, in fact, when he appears at the dig site and sees first-hand what he is dealing with - not a church in extreme ruin, but one so well-preserved that it's as if it was constructed and then buried immediately thereafter. In such a position, any narrative (flimsy or otherwise) would be foolish not to allow its characters to be a bit curious, and "Exorcist: The Beginning" takes that step without surrendering personas to sheer stupidity like so many recent thrillers. It isn't enough for Merrin to simply investigate the exteriors of this strange church; no, he has to see it on the inside for himself, a conclusion that gets him little support from the superstitious natives who live in the area. Understandably so, too, because when the fallen priest descends into the structure, what he finds is anything but holy. In fact, what he uncovers is downright disconcerting: an edifice filled with ominous symbols and dark underground caverns, made all the more unsettling by a giant crucifix that has seemingly been ripped from its foundation and hung upside down. This, the movie later realizes, is the exact spot where Lucifer fell, and that its discovery comes precisely when the neighboring village is confronted with a slew of unexplainable tragedies only enforces a growing suggestion that the disturbance of the church has reawakened some kind of evil spirit buried underneath. 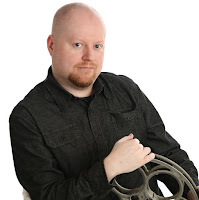 As a film director, Harlin has never really been equipped with the right tools to make a genuine horror film (his last big attempt was one of the many sequels in the "A Nightmare on Elm Street" franchise), but when it comes to filling the screen with all sorts of adrenaline, there is no denying that he does it well. That concept has never been more apparent than with "Exorcist: The Beginning," a movie that isn't really scary or hair-raising on a psychological level, but is at least admirable in the way it gives isolated scenes such a chilly resonance. One particular sequence involving a group of African natives attempting to perform their own exorcism on a potentially-infected individual accommodates all the values of these kinds of creepy moments: slick camerawork, a thumping soundtrack, ambiguous special effects, and actors who stare at each other as if the world around them is just about to crumble. 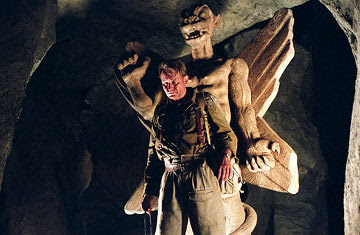 Harlin's visible display of energy is so great here, in fact, it is essentially the selling point of the entire movie (not that long and involved final battle between Merrin and the evil spirit who has been reawakened, which feels more like an uninspired retread of Merrin's other exorcism rather than an isolated bout with evil forces). When it comes to the screenplay, however, Harlin is essentially dealing with an endeavor seeped in obvious amateurism. The movie isn't so much telling a story as it is tossing around a collection of spooky images. That, more or less, may come down to the fact that the narrative is a prequel to already well-known events, but newcomer Alexi Hawley could easily have found inspiration outside of the spinning heads and pea soup projectiles to concoct a noteworthy setup. Where is the psychology in all of this? Where are the plausible supporting characters that assist in building the level of reality needed to give the scares a lasting significance? What made the first "Exorcist" film so powerful wasn't just the notion of a visible evil manifesting on screen, but also the notion that it happened to real people in a real world. This prequel skips past all of the subtext and goes straight for the gore. Still, the gore is fun to a certain extent. Minus all the missed narrative opportunities and the transparent characterizations, Harlin's "Exorcist: The Beginning" has that certain surface charm that at least makes it enjoyable on a level of escapist entertainment. Would a more psychological thriller have been a better route for these filmmakers to take? That goes without saying. But even then, it's difficult to be too critical of what we get in the end. Considering the level of ineptitude that has plagued this series beyond the brilliant original chapter, we should consider ourselves lucky that we got something halfway coherent this time around.